Blogging has opened up an entirely new world for me. When I started The Angel Forever almost six years ago, I had no idea that I would be building a brand. The reality is that slowly the need to think about how I present myself in Social Media and beyond as the person behind The Angel Forever became evident. I had to be the voice behind my blog and not simply Beth. Gone are the Tweets where I vent about things at school. Sometimes, you will still see personal items like notes about the crazy weather and parenting, but that is showing a side of my brand – the Mom. At various Social Media events – including BlogHer, SheStreams, and Disney Social Media Moms – I took notes from people about how to build a brand. Slowly, I have been working on this. Of course, at the same time you also have to think about your online reputation. Not only do big companies have to think about this, but bloggers do as well. 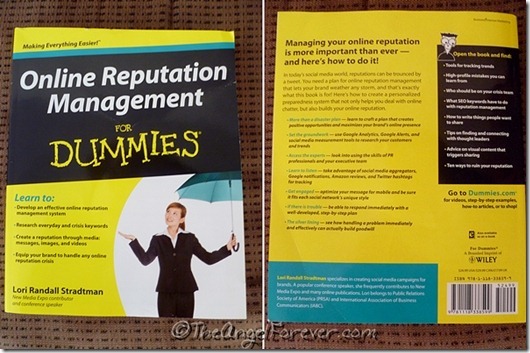 Thanks to an opportunity with For Dummies, I was able to receive a copy of Online Reputation Management For Dummies . Heading into 2013, I have goals for myself. With these items in mind, I need to be ready to manage my online reputation. Author Lori Randall Stradtman mentions “Expecting the best and preparing for the worst.” The inner Eeyore in me laughed and nodded at that statement. The reality is that you must be prepared and have a plan ready. The last thing you want to do is panic and let emotions guide you IF you need to fix something. As a victim of cyberbulling by someone who has targeted many bloggers over the years, I am always looking to learn. I adore that Stradtman makes a point to remind people that Reputation Management is not simply another way of saying damage control. She’s right. It’s a process that takes time and her book helps others to do this. Getting Started with Online Reputation Management —Learning what this means and what approach will be best for you. Organizing Your Teams – In addition to an everyday team, you need to think about people/professionals that can be on your crisis team. Listening Is Love – What monitoring tools to use, how to utilize SEO Keywords, and setting everything up to check what is being said. Establishing Your Reputation – Engagement via Social Media, making your brand, defining your message, reaching out to groups, tips on writing to get attention, using visual to get message out there, and getting others to spread your brand. Responding to Crisis: Your Step-by-Step Plan – How to manage issues as they grow, working on a crisis, and making personal connections (this was a life saver in my situation). The Part of Tens – Reputation tips for special events, faceplant moments, and making readers/fans happy. Since the book arrived, I have had time to scan it over and get a general feel for what is inside. What I have realized, I need more time to read certain areas that are more of what I will utilize in the weeks ahead. I know I need to monitor a bit more, especially with the past cyberbully issues. I also need to really home in on defining my brand and working with the writing tips like catchy titles, adding SEO keywords, creating lists, how to, and other items within Chapter 12: Writing Your Way to the Top and Chapter 13: Using Visuals to Spread Your Message. I already use Facebook, Google+, Twitter, and Instagram. Now to use them more to build my brand via Online Reputation boosting strategies from Stradtman while also being prepared to protect and respond IF something should happen. Now I have a plan of action with the Online Reputation Management Cheat Sheets available online, along with my own outlines. As I enter 2013, I have a plan on where to focus my attention so I can get more specifics to utilize in my strategy from this book. Do you have an Online Reputation Management strategy? I would love to know your thoughts on this topic thanks to our new Social Media and online world. Thank you so much for your kind and compelling review for bloggers! You’ve been at this a long time, so you really know your way around some of this stuff. Am glad I was able to provide you with a little more food for thought/action. Lori RS´s last blog post ..Instagram sells photos of your kids. Now what? 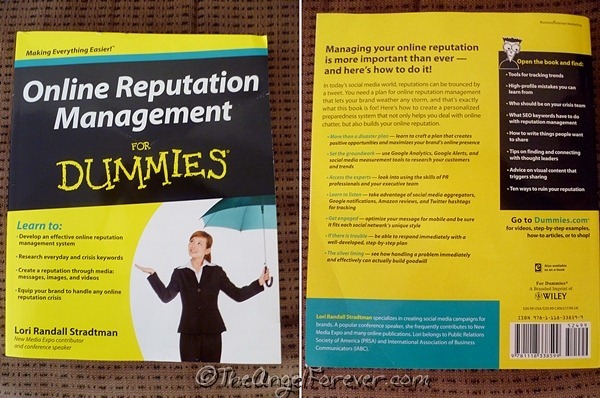 Really compelling reviews for this blog, Now a days Online reputation management has a great role.Online reputation management is a process of right information when the people look into you in search engines..